There is no getting around it. Pets are big part of our lives and our spending in America. However, there are distinct differences in the demographics of spending between the industry segments. The Prices in the Service Segments, especially Veterinary have been strongly inflating. Sharply higher prices affect the spending of a wider range of groups. Veterinary Spending was up $3B from 2013 despite a $1B drop in spending from consumers making $50K or less. Both the Food and Supply segments have been deflating in recent years so a lower H/H income is less of a factor. Also Pet Products (Food & Supplies) are a “must spend”. If you have a pet, you spend money on Pet Products . For this report we’ll take the services out of the mix and just look at Pet Products. First, let’s “bundle” segments together to reach a dominant market share of Pet Products spending (80%). Like Total Pet Spending, Homeowners, Metro Area Dwellers, H/H’s with 2 or more people, White Not Hispanic and H/H’s with income over $30K are all groups which exceed 80% of Pet Products spending. Let’s dig a little deeper. “Which of the 80+ individual segments are performing best in Pet Products?” The chart below identifies the best and worst performing segments in key demographic categories. The performance of each segment was determined by comparing the share of total pet spending to the share of households. Ex: If a segment accounts for 10% of households but generates 15% of Pet Spending the score is 15/10=1.5 = 150%…a great performer. However, if the situation was reversed, 10/15=.67 = 67%…not so good. Married Couples with children, Homeowners vs renters, Rural vs Center City, Larger family H/H’s, White Not Hispanic, the 45-54 yrs age group… Some of the best and worst performers are exactly what one would expect. African Americans are the lowest of the under-performing groups. The most recent American Housing Survey indicated that Pet Ownership by African Americans H/H’s was about 50% of the national average! 2 of the fastest growing occupations in the U.S. are Service Workers (+1M) and Self-employed (+300K). Both had increases in Pet Products Spending per H/H but the Service Workers spending increase did not keep up with the 7% increase in the number of H/H’s. Higher Income and higher education both are harbingers of increased pet product spending. However, pet ownership crosses all income and education levels. The lowest performers are still relatively high. The Under 25 age group…Getting people started as “pet parents” must be an industry priority. We have identified the best/worst performing segments. Which ones are “on the move”- the segments within each category with the biggest $ gain or loss (or smallest gain) in Pet Products Spending from 2013-14. 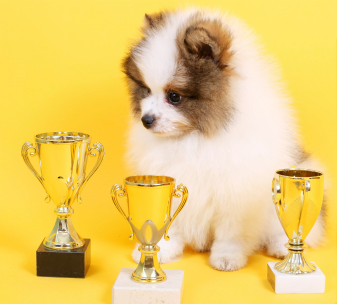 POINT #1 –When we looked at Total Pet Winners & Losers, 8 of the 10 categories had negative segments. For Pet Products, only 4 of 10 categories have any negative segments…at all! This is great news! Let’s take a look! Income – Although higher incomes fueled the increase, every major income group spent more on Pet Products. Occupation – The Self-employed group grew by 339K in numbers and their Pet Product Spending per H/H went up 26%. 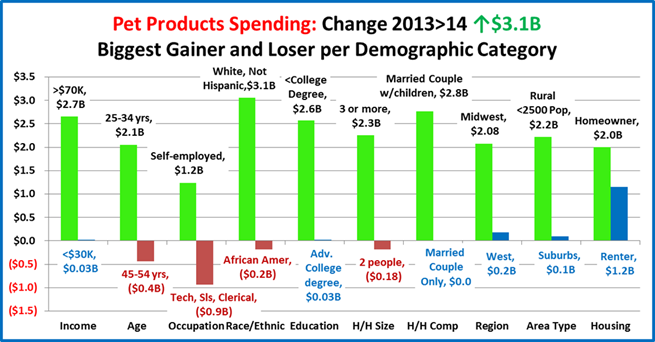 The Tech, Sales, Clerical group numbers fell by 339K and their Pet Product Spending per H/H dropped by 17%. They were the only occupational group with a drop in Pet Products Spending per H/H. Race/Ethnic – 70% of H/H’s (White) account for 87% of Pet Products Spending. African Americans were the only racial/ethnic group with a decrease in Pet Products Spending…despite a 535K increase in H/H’s. Highest Education in H/H – All education groups had an increase in spending. 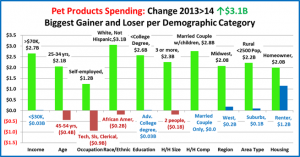 The group with less than a college degree is leading the way in the increase…a nice surprise. H/H Size – It just takes 3 or maybe 1. Even singles had a significant increase in their spending. Two person H/H’s showed the only decrease. As you will see in the next category, these twosomes were not married couples. H/H Composition – Married Couples with children drove the increase. No groups had a negative number. The “Married couple only” group was flat in spending. Even single parents showed an increase. Region – Spending was up in all Regions. However, the Midwest was up $2.1B and the West…only $0.2B. Area Type – Consumers in areas with under 2500 population, both inside and outside of Metro areas, are showing the most growth. Suburbs, the biggest spending segment is showing the slowest growth. In fact, spending per H/H is actually down slightly. Housing Tenure – Homeowners are at the top with +$2.0B, but even Renters had a $1B increase (+16%). Major Issues: 1.The ongoing concern of more racial/ethnic diversity in Pet Ownership. 2. Getting the under 25 age group started. 3. Two big spending groups are slipping – the 45>54 age group and consumers residing in the suburbs. Both are spending less per H/H. The ongoing deflation in Pet Products could be a factor. Innovative, new products is certainly one way to motivate these firmly established “pet parents” to spend more.